Speaking at a genetics conference in Hong Kong earlier this week, embattled Chinese scientist He Jiankui said he was “proud” to have created the world’s first genetically edited babies, despite receiving near-universal condemnation from his peers. Speaking publicly today for the first time, the scientist offered new details about his unauthorised, clandestine project – including news of another woman who is pregnant with an edited embryo. On Monday, an Associated Press report of the world’s first gene-edited babies – twin girls nicknamed Lula and Nana – rocked the scientific community, and not in a good way. Chinese scientist He Jiankui admitted to using the CRISPR/cas9 gene-editing tool to modify human embryos, in hopes of making them resistant to HIV. He said the girls, who were born earlier this month, are “normal and healthy,” but critics say it’s still too early to judge. While outside scientists have yet to confirm that He truly did genetically edit human embryos, if the claims are true, the experiment represents a major breach of research ethics. He’s achievement, if it can be called that, was widely condemned by scientists and ethicists, who railed off a litany of concerns. CRISPR, for instance, has been used to modify human embryos before, but much is still unknown about this pioneering biotechnology and how it might affect the long-term health of genetically edited humans. In the U.S., for example, scientists are allowed modify the DNA of embryos for research, but edited embryos can’t be implanted in a mother’s womb and must be destroyed. The U.S. National Academies of Sciences, Engineering, and Medicine says human gene-editing is a good idea in principle – it’s just way too early to start making genetically modified babies. It could be years, decades, or even an entire generation before all the risks are known. Given this nascent stage of human gene-editing technology, He was condemned for engaging a high-risk experiment that wasn’t medically necessary, and for going about his research in a highly clandestine manner. The scientist, it has been argued, violated established scientific and ethics standards and failed to make his work transparent, and it’s not clear if the parents fully understood the nature of the procedure. And in another major turn, New Scientist reported earlier today that He said “there is another potential pregnancy,” though he cautioned that it’s still at a very early stage. The point of this gene-editing experiment was to engineer an immunity to HIV/AIDS directly into human DNA. To accomplish this, He used CRISPR/cas9 to disable CCR5, a gene that produces a protein that makes cells vulnerable to the AIDS virus. Assuming the experiment will work as intended – still a big if – the twin girls will go down in history as the first genetically enhanced humans. Indeed, this modification can be regarded as an enhancement, and not a therapy, though a strong argument can be made that, in the case of interventions like immunity, no distinction can or should be made. 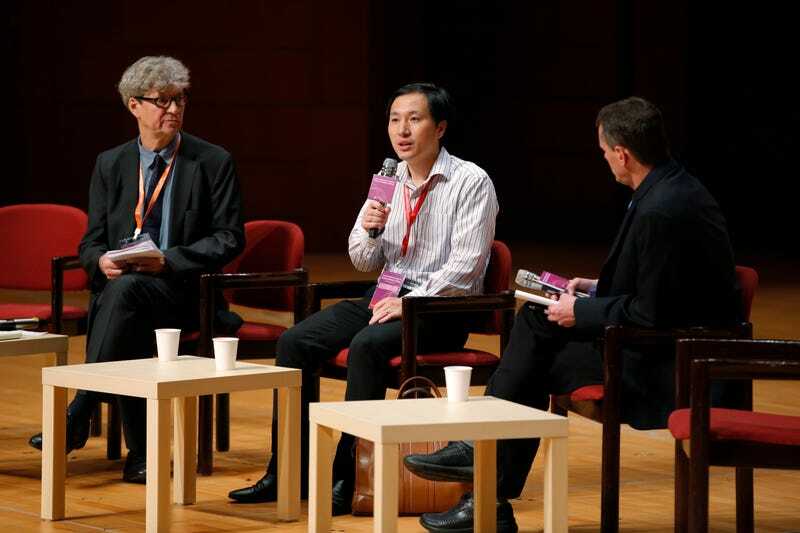 He Jiankui speaking at a panel discussion during the Human Genome Editing Conference in Hong Kong. During his talk, He said the girls will be monitored for the next 18 years, during which time they’ll be evaluated for unintended mutations and unexpected side-effects, in addition to confirming their resistance to HIV. As AP reported earlier this week, eight couples were initially enrolled in the trial, with one dropping out. All men involved in the study had HIV, but the women did not. A major rationale behind the experiment, He explained, was to provide these couples with children who were genetically immune to HIV. At his talk today, He said 30 embryos were created during the trial, of which 70 percent were gene-edited, as reported by New Scientist. The trial is now on hold given the global backlash (the status of the newly announced pregnant woman notwithstanding). The birth of the twins was the culmination of a three-year project, which involved mice, monkeys, and eventually human embryos, He explained. Details of the trial have been sent to an unnamed scientific journal for peer review – which seems a little late, given that the girls have already been born. Professor He said the parents were “informed of the implications,” adding that they had the “option to leave the trial without implantation, or to choose the embryos,” the NYT reports. The “couple elected to implant these embryos to start a two-embryo pregnancy,” said He. The mother refused amniocentesis during her pregnancy to scan for genetic abnormalities, something that was done after the girls were born. During a panel discussion after He’s talk, the scientist faced a barrage of questions and criticisms from the Summit delegates. When asked why he deemed it necessary to perform the experiment in secret – which he did, for example, by foregoing normal communications channels and not seeking approval from Chinese regulators – He said he spoke to several experts about the prospect, New Scientist reported, though he provided few details about the substance of these conversations or the names of those involved. He also admitted that the Southern University of Science and Technology wasn’t informed of the work; the scientist is currently on unpaid leave, and he didn’t tell the university that its research money was being used for this unauthorised gene-editing experiment. And as AP reported earlier this week, He waited until early November to list the research in the Chinese clinical trial registry, and medical staff involved in the project thought they were doing normal IVF for couples, the only difference being the inclusion of genome mapping. Indeed, other methods exist to protect offspring from an HIV-infected parent, such as drugs that keep the disease in remission. At the Summit, He offered a different perspective, saying the couple had “lost hope for life,” and that “with this protection [the father] sent a message saying he will work hard, earn money, and take care of his two daughters and his wife for this life.” These statements betray He’s poor understanding of medical ethics, proffering a weak excuse in which the parents’ psychological needs, however genuine, are placed ahead the needs of prospective children; doctors should never engage in illegal activities and put human lives at risk for reasons such as this. As for He’s claim that the babies are “normal and healthy,” that can’t possibly be known at the moment, even if their DNA currently looks normal. Off-target mutations in other genes – a problem known with CRISPR – are still possible, the effects of which may reveal themselves a later time. Also, modified genes could appear in some cells, but not all – a condition known as mosaicism. Importantly, these modifications were made to germline cells, which means this trait is now heritable. Should serious abnormalities be detected in the genes of these twins, it could stop them from having children of their own for fear of passing deleterious traits down onto the next generation. The problem with professor He’s actions isn’t that he engaged in human gene-editing – it’s that he acted prematurely. As a final note, it’s important to address another major concern associated with this research – the prospect of so-called designer babies. Indeed, the whole point of human gene-editing is for parents to garner greater control over the genomes of their offspring. But there’s a fear that genetic therapies, such as the elimination of genetic diseases, will eventually give way to genetic enhancements. Some conservative bioethicists warn that parents will use this technology to endow their children with greater intelligence and memory, or select specific physical characteristics such as hair and eye color. Without a doubt, we’ll have to be careful as we move into this uncharted genetic territory, but we shouldn’t preclude the possibility altogether. Human trait selection, in which specific enhancements are chosen by parents, could be a good thing – like giving our offspring built-in immunities to diseases such as HIV/AIDS.